The Yarmouth-Freeport girls hockey team came away with an overtime win Monday night with a late third period and over time goal scored by freshman Olivia Bradford. Yarmouth-Freeport faced a resilient and determined Gorham/Bonny Eagle team who came out with with speed in the first period. Yarmouth-Freeport was sent to the box early in the period for too many players on the ice but Gorham was unable to score. Yarmouth-Freeport would be given a power play opportunity half way through the period but was also unable to put the puck in the net and the period ended 0-0. Four minutes into the second period Yarmouth-Freeport’s Grondin gets a breakaway and scores to put the Clippers on the board first but Gorham responds with 7:55 remaining in the second on a power play from a hook by Caulfield. Gorham is then called for a hooking penalty and Yarmouth-Freeport is given another power play opportunity, but it is cut short when Grondin is called for hooking at 4:12, neither team is able to capitalize on 4 v 4. With 1:57 left Guay is given a roughing penalty but Gorham is denied much of power play opportunity when their player is sent to the box at 1:24 for a hook. The score is tied 1-1 to end the period. Guay’s penalty expired three second into the third period and Yarmouth-Freeport is back on the power play for 1:20. Gorham floats a player in the neutral zone hoping for a breakaway and Yarmouth-Freeport was unable to capitalize on 5 v 4. Gorham returned to full strength and play continued back and forth with no goals until Gorham found the back of the net with 2:55 left in the game to take the lead 2-1. 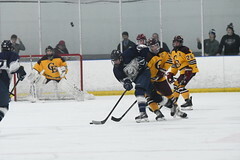 Freshman Bradford tied the score with 1:25 remaining on a breakaway during another Yarmouth-Freeport power play from a hooking called on Gorham and the game was sent into overtime. Bradford comes up big again and scores the sudden death game winner on another breakaway with 3:49 left to play. Yarmouth-Freeport takes the 3-2 win and improves their record to 9-4-0. Yarmouth-Freeport played their best game of the season so far in a hard battle against second seated (south) Scarborough. Despite continuous back and forth play Scarborough was able to find the back of the net while Yarmouth-Freeport narrowly missed several times and fell 1-4 for the final score. The first period ended scoreless for both teams. 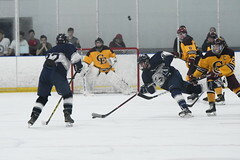 Yarmouth-Freeport’s Perrotta kept Scarborough off the board with some great saves and Yarmouth-Freeport produced some scoring opportunities and several turn overs with an effective forecheck. The second period started with Scarborough adding more pressure and scoring five minutes in. Yarmouth-Freeport senior Grondin received a penalty for holding 9:06 in the period, but Scarborough was only given the power play opportunity for thirty seconds before being called for interference. Neither team could capitalize on 4 v 4, but shortly after senior Lydia Guay split Scarborough defense for the breakaway and just missed the far right side of the net. Scarborough scored one more goal with two and a half minutes left in the second to bring the score 0-2. Sophomore Lilly Weinrich put Yarmouth-Freeport on the board 1:04 into the third period with a high shot that rung the inside post behind Scarborough goal tender making it 2-1. Scarborough was able to find the back of the net two minutes later bringing the goal difference back to two and scored again make the score 4-1 with ten minutes to go in the third. Junior Sophie Newberg of Yarmouth-Freeport was sent to the box for cross checking with 4:54 left in the game, but Scarborough was unable to capitalize on the power play. 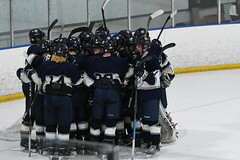 Yarmouth-Freeport would then be given the opportunity for a power play when freshman Bradford was pulled down during a battle on the boards at 13:49 into the third, but unable to score before the buzzer sounded.